Are you a true crime fanatic? I am. I have been ever since sneaking Helter Skelter into the house when I was 11 and reading it surreptitiously (and scaring myself in the process). To this day there are certain true crime books that I read with extra lights on, making sure the doors are locked and there is at least one (The Night Stalker by Philip Carlo) that I would not leave in the room with me when I slept. Don’t ask; I’m not sure what difference it made either. I have been obsessed with the Fatal Vision/Jeffrey MacDonald case since I saw the miniseries (remember those?) back in 1984 and immediately took my Burger King paycheck to the B. Dalton at the local mall to buy and read the book. And did I ever – – I stayed up until 2 or 3 in the morning (because that was cake when I was 16 years old) reading under my covers because I couldn’t devour the book fast enough. I read and re-read it many times over the years. If you haven’t read it, I suggest that you do. Despite the murders happening in 1970, the case continues to live on due to convicted killer Jeffrey MacDonald’s dogged and tenacious insistence that he is innocent and a band of hippies a la The Manson Family invaded his family’s home and slaughtered his wife and two daughters and attacking him. The legal case on this matter is voluminous enough to make your head explode. Every person deserves their day in court but MacDonald seems to have made a career out of it. Joe McGinniss, who authored the aforementioned Fatal Vision, provides an e-book update as to all the legal goings-on with regard to this seemingly never-ending case. I posted a review back on the 43rd anniversary of Colette, Kimberley and Kristen MacDonald’s deaths and am sharing it here. Please feel free to follow my book review site (Psychotic State Book Reviews) and let’s talk about this case, or any other true crime case that has haunted you, confused you or just plain obsessed you. It is the longest-running criminal case in U.S. history, and one of the most horrifying murder cases of its time, with chilling echoes of the Manson Family’s “Helter Skelter” killings: Jeffrey MacDonald, a handsome, Ivy League–educated Green Beret Army doctor, accused of brutally stabbing and clubbing to death his pregnant wife and two young daughters in the middle of the night. MacDonald was eventually convicted and is serving three consecutive life sentences. The writer Joe McGinniss first got drawn into the story in 1979, when he began work on what became the definitive account of the case, “Fatal Vision.” But in the years since, MacDonald has never stopped filing appeals, and several high-profile writers have raised questions about whether he might be innocent after all. McGinniss, largely silent on the topic for years, finally rebuts them all in this compelling follow-up to his 1983 bestseller. Forty-three years after the murders, the controversy lives on. MacDonald, now a gray-haired sixty-eight-year-old, continues to attract supporters, most recently acclaimed filmmaker Errol Morris, whose recent book casts doubt on the conviction. The ruling on MacDonald’s latest motion for a new trial is due in early 2013, but as McGinniss makes clear in this fascinating, authoritative book, his guilt is undeniable. 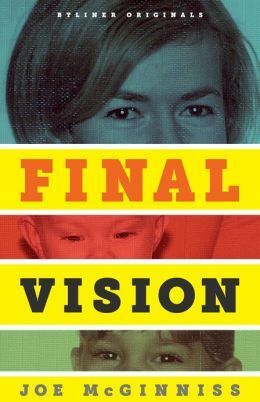 Final Vision comes hot on the heels of Errol Morris’ recently published A Wilderness of Error, a lengthy tome which supposes that convicted murderer Jeffrey MacDonald did not receive a fair trial and could quite likely be innocent of the horrific murders of his wife and children that he was convicted of in 1979. Author Joe McGinniss wrote the first book on the infamous case, Fatal Vision, after being hired by MacDonald and his legal team to write a book on the then nearly ten year legal journey. McGinniss came to the conclusion that MacDonald was indeed guilty of this unfathomable act after attending every day of the trial and studying the evidence. His groundbreaking work became not only the basis of a 1984 miniseries starring Gary Cole and Karl Malden but “the book about the case became part of the case”, to quote McGinniss, when he was sued by MacDonald. McGinniss has updated readers with recent events on the MacDonald saga. Final Vision is not for readers new to the MacDonald case; it’s for those like me, who have read every book on the case and are obsessed (or least have read Fatal Vision). This is a short series of updates and McGinniss is very clearly ready to move on from this case; his writing sizzles with irritability. Is there anything new that’s been revealed? Not really, but as a fanatic for this case, it was worth the one sitting it took me to read it. For more, please go to Psychotic State Book Reviews. I’m curious to know how you came to your opinion on his innocence. Would you like to share? « Why Should I Listen To You?